Frame wall piece constructed from recycled materials specifically tin cans and vintage steel dollhouses, aluminum rivets. Each frame is a fabricated from a different tin can. The corners are carefully mitered to fit which is the most challenging part about the fabrication process. This piece is from a series of work based on fan quilt patterns titled, The Deceiver and The Deceived. The relentless messages conveyed in media and advertising about a woman's appearance reveals an questionable aspect of our consumer culture. 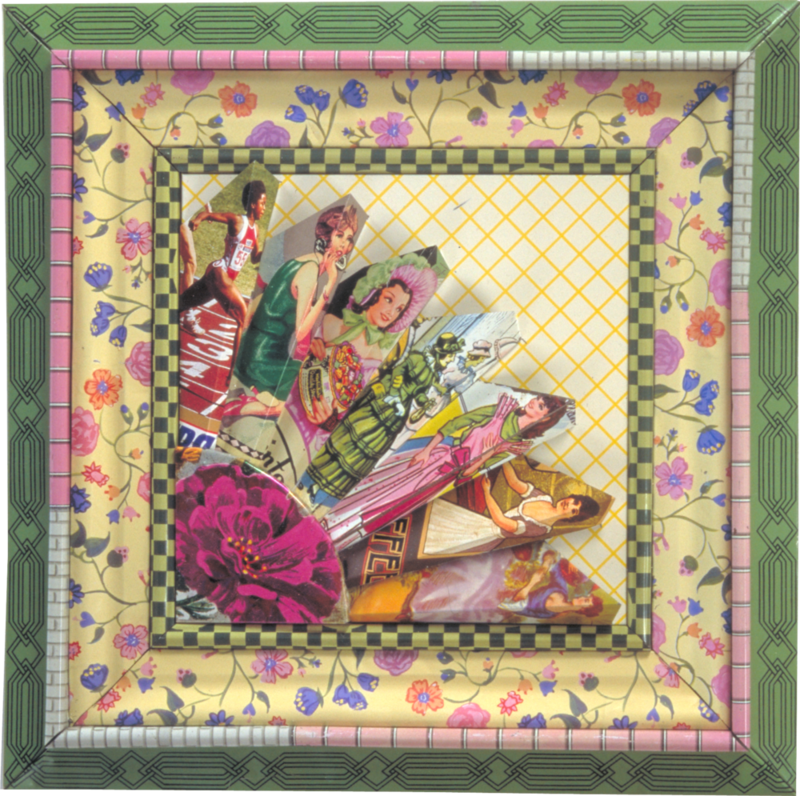 Who is the deceiver and who is the deceived in our society when women are portrayed as “pure, alluring, refreshing, and delicious, good as homemade?” In this particular wall sculpture the lady with the pink bonnet with green feathers came from a candy tin. I think it is really interesting how there is this association with candy, and the sweet appearance of women. An archaic image and association but still used today in advertising. In the photo (left) you can see the back of this particular wall piece. Through the "window" you can see how the fan elements were inserted into the center square. At the bottom of the frame (in the purple rectangle) the title, artist's name, date and hallmark are stamped into the metal to establish the provenance of the work.